Everyday the headlines are full of hype about blockchain and cryptocurrencies – wildly speculative boosterism on one side, and wildly pessimistic skepticism on the other. Does that leave you feeling confused? I feel your pain. As a fund manager and media commentator, it’s my job to sort through all the noise, and sometimes it’s a challenge even for me. As an enthusiast for this new technology, I believe that its disruptive power will be greater than that of the internet. In 30 or 40 years, the world will be a very different place thanks to blockchain technology, and all the new applications that use it – including cryptocurrencies. As a realist, however, I have to identify and invest in opportunities as they exist today. Just as you do. One first needs a compelling thesis to warrant putting money behind specific opportunities. Then one needs a strategy for accessing them. So, what’s the thesis, and what’s an efficient way for equity investors to capitalize on the opportunity? First, blockchain and cryptocurrencies represent a potential tectonic shift in the way people transact business with one another – in the public sphere as well as private markets (although some believe the technology will never pan out). It’s what we in the macro investing world call a secular trend, and one doesn’t encounter secular trends of this magnitude many times in one’s career. It could be a long-term growth story that we have not seen for a long time, and it may be decades more before we encounter anything similar. Second, I believe that this space is evolving so quickly, and the opportunities are so diverse, that it requires specialized attention. For me, that means a dedicated, actively managed equity investment sleeve, backed by sufficient research and industry knowledge to sort out the strong long-term opportunities from the gimmicky initiatives that may sound good, but won’t last. That sleeve can fit within most growth equity strategies with the understanding that this is very much a global story. For now, at least until this shift matures, I think it also tilts to the small- and mid-cap space. The early years of the internet represented a secular trend. And while a tech bust in 2001 cleared out the clutter (anyone remember DrKoop.com? ), the internet nevertheless powered forward with the meteoric FANG stocks, as well as entire new industries that were unimaginable until the internet became entrenched in the global economy-revolutionary new industries like cloud computing, software as a service, streaming content, and peer networks like Uber. Who could have imagined such things in 1993, when people were still using dial-up modems? That’s where enthusiasts believe we stand today with the blockchain revolution: We’re in the first, very early days of a secular trend that will be reshaping the world for decades to come. Take the financial services industry as one example: every asset we have – stocks, commodities, bonds, and currencies – can be envisioned living on a blockchain. We are already seeing financial services companies vying to lead blockchain development for payments, securities clearing and lending, trade finance, and many other applications. Innovators like Goldman Sachs are leading the way, but even avowed skeptics like JPMorgan are rapidly building their blockchain capabilities. More than that, I tell everybody, even non-finance types, to take a look at their organization: Wherever people are verifying and processing transactions, those products, services, and systems are ripe for disintermediation. Enterprise blockchain can potentially improve all of them: reducing transaction times, streamlining processes, increasing efficiency, improving security, reducing errors, increasing transaction capacity, and enabling greater collaboration. How big is the enterprise blockchain opportunity-what venture capitalists might call TAM or Total Addressable Market? I see at least 30 different industries that could be impacted. That’s a sizable TAM, and a rapidly growing opportunity set that I want access to as an equity investor. My journey from skeptic to crypto investor is well documented in my book, for those who are curious. But the outcome of that journey is a firm belief that cryptocurrencies are a technological and monetary breakthrough – a brand new asset class – that is ideally suited to an emerging global, digital ecosystem. Quickly, let’s be clear about our terms: A crypto “currency” is the token associated with blockchain technology. Cryptocurrency issuers use blockchain technology to create a secure, global, low-friction way of storing and transferring value. Each issuer calls their mode of transaction a token – i.e., bitcoins, litecoins, and ether, are all types of tokens. People can buy these tokens and then transact with anyone else who is using the same “currency” system. I believe that there are two key themes to watch in the cryptocurrency space: adoption, and interoperability (i.e., “convertibility”). 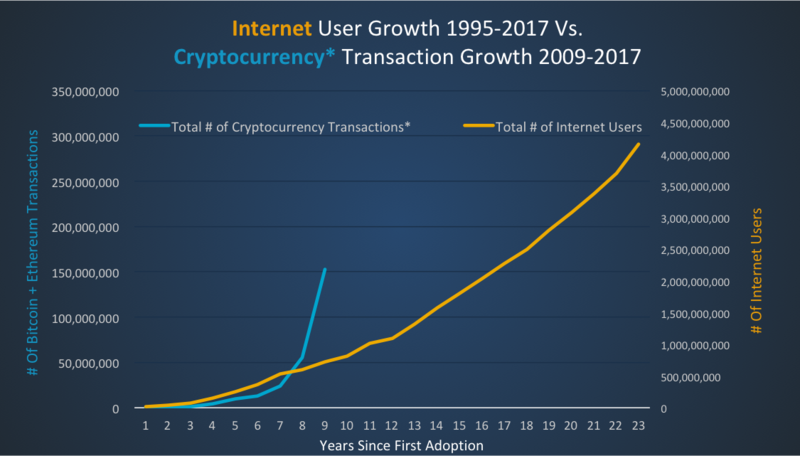 Adoption is accelerating rapidly. One recent headline touted the ability of travelers to use cryptocurrencies at every merchant in the Brisbane International Airport, in Australia. Online merchants like Overstock and Shopify are enabling shoppers to pay with cryptocurrencies. Dozens of crypto-ecosystems have been launched, each with its own unique parameters and goals. Even American Express and other issuers of rewards points are putting their ecosystems on a blockchain, vastly increasing their members’ ability to earn and spend rewards points-making those points ever more cash-like. That’s the interoperability part: crypto issuers (even traditional payment providers and retailers) are finding more and more ways to increase the convertibility of digital currencies. That may mean converting one cryptocurrency to another, or converting a cryptocurrency into fiat currency. 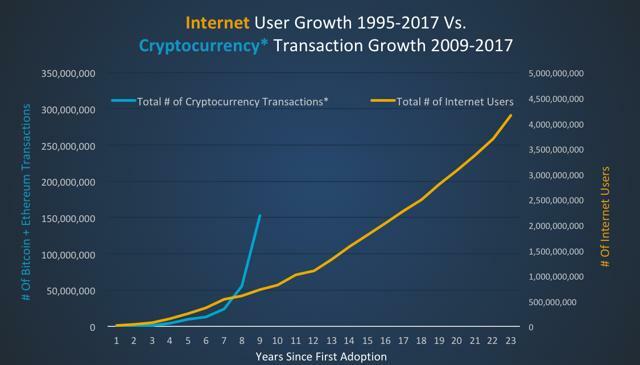 Those trends are driving parabolic growth in crypto transaction volumes (see chart comparing to internet user growth). Like enterprise blockchain, it’s a rapidly growing opportunity set that I want access to as an investor: The equity opportunities in this space being the “mining” companies that earn fees for processing cryptocurrency transactions and the hardware manufacturers whose equipment supports these capabilities. Now comes the hard part. Identifying potential winners in the blockchain space is unfortunately a lot more complicated than just updating a standard stock-screening tool. In my view, it also requires a lot more judgment and flexibility than following a passive index, which may take three to six to 12 months to implement portfolio changes. One has to remember that this is an emerging technology, and the modus operandi within this space is “crawl, walk, run.” In that vein, as one transitions from crawling to walking, there can be lots of bumps, bruises, falling down, and the occasional nasty head bang. Many highly publicized blockchain initiatives will fail because most tech initiatives fail: As a point of reference, consider that 95% of venture-backed startups don’t deliver the target ROI. In my view, these four themes are the most viable starting points for an investment strategy focusing on companies utilizing cryptocurrency or blockchain technology. In my mind, the key is evaluating potential opportunities as they exist today and not 20 or 30 years from now. Focusing on clear investment parameters – specific industries, companies, use cases, technologies, etc. – is the best way that I know of to chart a course through the noise and hype toward a sound investment thesis. 1Blockchain is a decentralized, digitally disseminated ledger of data. The basis of a successful blockchain system is once a new group of information, or “block”, is added, the information automatically disseminates and is downloaded to each computer on the network. This assures that a single computer could not change information on a block: it would be overruled by a consensus of all the other computers on the network. This process renders all information on a completed block decentralized and theoretically permanent. 2A cryptocurrency (crypto) is a digital currency typically utilizing a Blockchain system for transaction records and cryptography for security. The major differentiator from physical currency is it isn’t issued by a central authority and thus theoretically acts independently of traditional banking and government influence. A cryptoasset would be holding a certain amount of cryptocurrency, or a derivative for which value is driven by the price of an underlying cryptocurrency. Disclaimer: BKC contains Cryptocurrency & Blockchain Technology Risk. These are unique risks, that deserve time to research and understand before investing. BKC is not suitable for all investors. The fund should be utilized only by investors who are willing to assume a high degree of risk and intend to actively monitor and manage their investments in the fund. This communication is not an investment recommendation or a solicitation to become a client of BKCM Funds, LLC or its parent company, BKCM LLC (collectively, “BKCM”). Unless indicated otherwise, the views or opinions set forth herein are the author’s and may differ from those of BKCM or others in the firm. We do not represent that the information set forth in this communication is accurate or complete and we may not update this information. Past performance is not indicative of future returns. 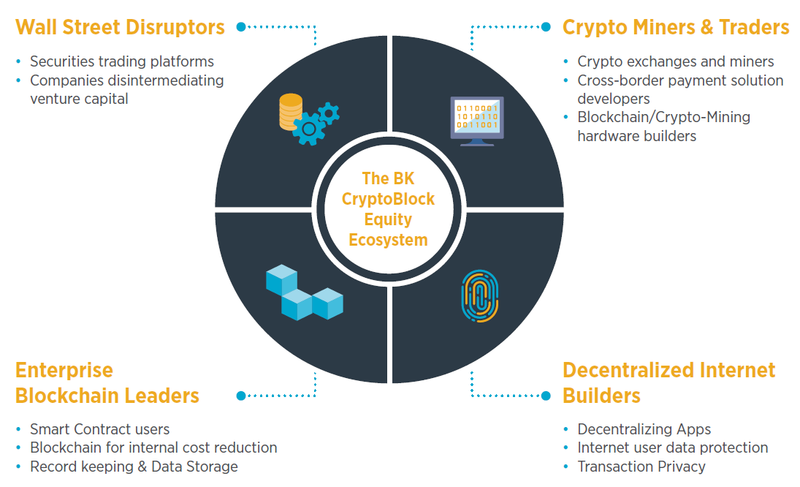 Not all of the companies BKC invests in may have significant revenue streams tied to Blockchain or Cryptocurrency. Blockchain technology may never develop optimized transactional processes that lead to increased realized economic returns to any company in which the fund invests. Please read further risks and information at REXShares.com/BKC. Exchange Traded Concepts, LLC serves as the investment advisor and Vident Investment Advisory & BKCM Funds, LLC serve as sub advisor to the fund. The Funds are distributed by Foreside Fund Services, LLC., which is not affiliated with Exchange Traded Concepts, LLC or any of its affiliates. Shares are bought and sold at market price (not NAV) and are not individually redeemed from the Fund. Brokerage commissions will reduce returns. Rex NAVs are calculated using prices as of 4:00 p.m. ET. The closing price is the midpoint between the bid and ask price as of the close of exchange. In addition to the normal risks associated with investing, international investments may involve risk of capital loss from unfavorable fluctuation in currency values, from differences in generally accepted accounting principles or from economic or political instability in other nations. In emerging markets, these risks are heightened, and lower trading volumes may occur. Investments in smaller companies typically exhibit higher volatility. Carefully consider the Funds’ investment objectives, risk factors, charges and expenses before investing. This and additional information can be found in the Funds’ summary and full prospectuses, which may be obtained by calling 1-844-REX-1414. Blockchain Technology Risk: The stocks in which the Fund will invest will be subject to the risks associated with blockchain technology, which is a new and relatively untested technology. The risks associated with blockchain technology may not emerge until the technology is widely used. Blockchain systems could be vulnerable to fraud, particularly if a significant minority of participants colluded to defraud the rest. Access to a given blockchain requires an individualized key, which, if compromised, could result in loss due to theft, destruction or inaccessibility. Cryptocurrency Risk: By virtue of the Fund’s investment in stocks that derive revenue from cryptocurrency-related activities, shareholders may be exposed indirectly to the risks of cryptocurrencies. Cryptocurrencies are extremely new and nontraditional assets and a potential shareholder’s ability to evaluate the performance of cryptocurrencies be limited. Digital assets, represented on a decentralized public transaction ledger that is maintained by an open source protocol, are substantively different from traditional assets and investments. Because of the complex nature of cryptocurrency, an investor in the Fund may face numerous material risks that may not be present in other investments. Current IRS guidance indicates that digital assets such as cryptocurrencies should be treated and taxed as property, and that transactions involving the payment of cryptocurrency for goods and services should be treated as barter transactions. This treatment may create a potential tax reporting requirement in any circumstance where the ownership of a cryptocurrency passes from one person to another. An investment in the Fund in is subject to risks including loss of principal. There can be no assurance the Fund will achieve it’s investment objectives. The Fund can be more volatile than broad market averages. Additional risks for the Fund include: emerging markets risk, foreign securities risk, geographic risk, geopolitical risk, liquidity risk, non-diversification risk, technology risk, and valuation risk. For a complete description of these risk please read the prospectus carefully. This contains information that is, or may be confidential or proprietary in nature. Unless specifically stated or otherwise indicated, you may not duplicate, redistribute or forward this or any portion thereof, including any attachments, by any means to any other person. If you are not the intended recipient, please be advised that you are legally prohibited from retaining, using, copying, distributing, or otherwise disclosing this information in any manner. Attachments that are part of an electronic communication may have additional important disclosures and disclaimers, which you should read. Furthermore, this communication is for information purposes only and should not be regarded as an offer to sell or as a solicitation of an offer to buy any financial product, or as an official statement of REX Shares, LLC or any of its affiliates. Nothing in this document constitutes investment, legal, accounting or tax advice or a representation that any investment strategy or service is suitable or appropriate to your individual circumstances. This document is not to be relied upon in substitution for the exercise of independent judgment. Past performance should not be taken as an indication or guarantee of future performance, and no representation or warranty, expressed or implied is made regarding future performance. The information provided herein is expressed as of the date hereof or such other date specified. REX Shares, LLC and its affiliates assume no obligation to update or otherwise revise these materials. Disclosure: I am/we are long BKC.